On south side of Middle Bourne Lane 40m from Junction with Aveley Lane map reference SU 839 449, overlooking the deeply incised valley of the Bourne Stream, which is an important green corridor for the movement of species through the developing suburbs of South Farnham. The soils are free-draining and sandy. The situation is now suburban, but a century ago it was open heathland. The garden is approximately 30m square. It is located on the edge of the steep Bourne Stream valley and is south facing with a good outlook. The main area slopes gently southwards but slopes steeply down along its southern boundary. It has a mix of habitats – including mature trees and shrubs, a bramble thicket, a rough lawn, a pond, a small heather garden, an area of wild flower meadow, and a new herbaceous border. When we first took over its management it had been neglected for some time, and we were careful about bringing it back under control. The north boundary consists of a hedge that is predominantly hawthorn; the other three are wooden fences. There is some furniture on site, which consists of a wooden bench and a picnic table. In the south-west corner there is a compost and storage area, which is screened from the rest of the garden by the mature trees. The garden has been subdivided into four main management areas or ‘rooms’. The southern area is where the mature trees are growing is managed as a woodland glade, except at its eastern end where a small heather bed has been developed. Also, at the eastern end is an area is devoted to wildlife habitats which includes the pond, a bog garden, a bramble patch and some unmanaged rough habitat where we have created a hibernaculum. The central area contains the wild flower ‘meadow’. And the western room is the amenity area where there is a area of mown grass, the herbaceous border, and the picnic table. In 2007, BCG first agreed with the Town Council to manage the site. 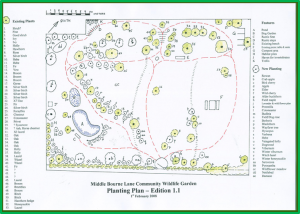 The first management plan was drawn up on the strength of which a successful bid was made to Biffa for funds to help to develop the site as a wildlife garden. The application not only successful, but we also won the national prize for the small projects for that year. The initial tasks were to clear the site of fly-tipped rubbish, to start clearing many of the invasive laurels, brambles and bracken, to plant some new trees and put up nest boxes. Our first major project was to dig a pond. Adding a pond is reported to be one of the best ways of enhancing wildlife in a garden, and our experience has fully vindicated this claim. 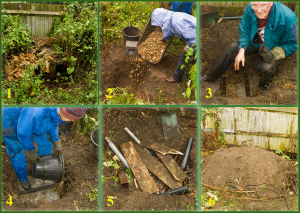 Digging a pond Is one of the quickest ways of improving a garden’s biodiversity. The stages of construction were firstly to choose an unkempt corner of the garden within a few metres of the pond. 2 A hole was dug just over a metre deep and the bottom was lined with gravel. 3 two layers hollow, concrete building blocks were places in the hole and then -4 filled with leaf mould from the compost heap. 5 the blocks were then covered with old planks of wood and tubes inserted to give access to the hollow blocks. 6. The hibernaculum was then back-filled with soil, making sure the access tubes were not blocked. 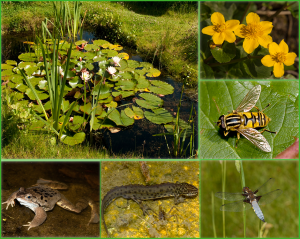 Unfortunately, we have no means of checking the effectiveness of the hibernaculum as a refuge, but the large number of frogs and newts that annually breed in the pond suggest it is being used. We have run several events in the garden to explore the variety of wildlife that lives in the garden. In the early years, the Surrey Wildlife Trust ran training events in the Garden for us. The year after we had dug the pond the Surrey Wildlife Trust ran a wildlife evening for us in 2009. One outcome of this evening was that we placed discrete signage around the garden. These panels are regularly updated and will be displaying QR codes. On a very wet day in 2016 we held a garden bioblitz; as a result, an astonishing 160 species of plant were identified. The bad weather was far from ideal for recording animals, and so few new records were added to our inventory of animal species. At present (2017) our inventory for the garden includes 213 moths, 13 butterflies, 65 other insects, 15 birds, 5 mammals and 4 amphibians and reptiles. These records have included the first record of the tree bumblebee in Farnham, and one of the earliest records of the ivy bee, which specialises in feeding on ivy nectar. Ivy (Hedera helix) is much maligned. It is an important feature for the wildlife in the Middle Bourne Lane Garden. It is very tolerant of shade and roots in the ground. It scrambles across the ground until it reaches a tree or wall up which it climbs. It clings on using adventitious roots and grows up towards the light. Once its shoots climb far enough to reach good light they produce leaves of a different shape – changing from the familiar ‘immature’ palmate to a simpler ‘mature’ leaf shape. Left – Immature palmate leaves: Centre – Mature leaves with ripening berries: Right- Flowers visited at night by a dark sword-grass moth. It is then ready to flower. Ivy starts to flower in September and can continue to flower into early November. The flowers are produced in round clusters of green, highly scented flowers, and produce copious quantities of nectar. In autumn there are very few other available sources of nectar, so the flowers are visited by a rich variety of visitors. They visitors come in two shifts, one by day the other by night. The day shift includes butterflies, hoverflies, honey bees, ivy bees, bumblebees and wasps. The day shift: L to R An ivy bee Coletes hederae, the hoverfly Syrphus ribesii, the hoverfly Volucella inanis (hornet mimic) and a red admiral butterfly. The night shift: L-R a millipede, a redline quaker moth, a frosted orange moth and a rough woodlouse Porcellio scaber. After sunset the night shift includes moths, woodlice, millipedes, snails, and earwigs. In 2017, 22 species of moth were photographed at night feeding on one local ivy patch. Once pollinated the flowers produce purply-black berries, which, despite being mildly poisonous to us, have been used in the past with doubtful efficacy to treat syphilis, the plague and to remove cellulite. Later in winter they are an important food source for many birds. In addition, thick growths of ivy provide protected refuges for many species and nesting sites for birds. Despite our enthusiasm for conserving the ivy in the garden, some had to be removed in 2017. Although ivy is not a parasite and causes no direct harm to any tree it climbs up, it does increase a tree’s vulnerability to being blown down in storms. Moreover, ivy flourishes particularly well on dead trees, which are even more vulnerable to wind throw. If such a tree fall injures anyone or damages their property the Town Council, as owners of the garden, would be held liable. So, for both financial and Health and Safety reasons some of the ivy had to be cut back in 2017. Garden features are in a constant state of flux, and there is never any let up in maintenance demands. 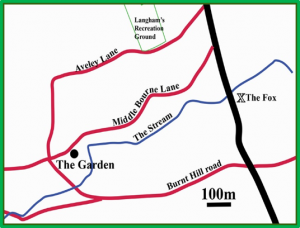 For example, the hawthorn hedge that lines the garden’s boundary with Middle Bourne Lane needs to be cut annually. The cut needs to be in winter, outside the bird nesting season and to encourage flowering and the autumnal berry production. The hedge makes an important contribution to sustaining the garden’s biodiversity. 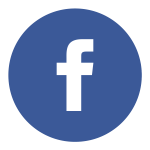 Each year from 2011 onwards, the garden has featured as part of Farnham’s entry in the ‘In-Bloom’ competitions run by the Royal Horticultural Society, initially just in the regional competitions but in 2016 and 2017 in the national competition. In 2017, this culminated in Farnham not only being awarded a gold, but also being declared joint winners in the large town category. 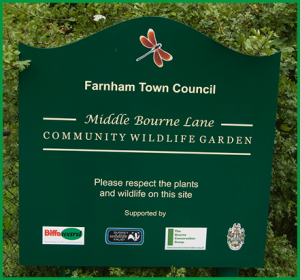 A significant fall-out from the Farnham-in-Bloom competitions was that when the BBC wanted to film a wildlife garden for the Spring Watch series, the RHS recommended they should film in Middle Bourne Lane. In September 2016, a film crew visited the garden and filmed some of our activities. The result was we featured in a brief sequence at the end of the 2017 series. BBC film crew filmed bramble trimming, life in the pond and turning over the compost heap. As part of our preparations for the Farnham-in-Bloom inspections, we completely replanted the herbaceous border. This turned into a major exercise. All the existing plants were removed – many were potted up and sold at the Bourne Show. The silver birch tree that was growing at one end was reluctantly taken down. Not only was it looking rather sickly, but it was drying out the bed in the summer, which then had to be watered. The planting was designed by one of our members Cathy Stewart who is a garden designer with a brief that there should be a long succession of nectar-rich flowers in order to encourage pollinators. Much of the planting effort was carried out by Vivienne Sinfield and was accomplished in time for there to be a superb display of flowers abuzz with bees to greet the Farnham-in-Bloom judges. 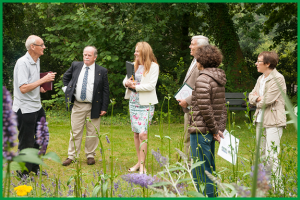 The national In-Bloom judges being briefed about the new planting of the herbaceous border.